Although currently available mouse models of Alzheimer’s disease constitute a powerful tool for studying the deposition of Aβ in the brain, they suffer from some important drawbacks. In particular, unlike prion-infected mice, transgenic mice with high levels of cerebral Aβ deposition do not exhibit overt clinical signs of neurological illness. Thus, it is very difficult to assess the disease status of the mice without resorting to postmortem neuropathological analysis of brain tissue. We are interested in developing methods for visualizing protein aggregation and neurodegeneration in the brains of living animals. 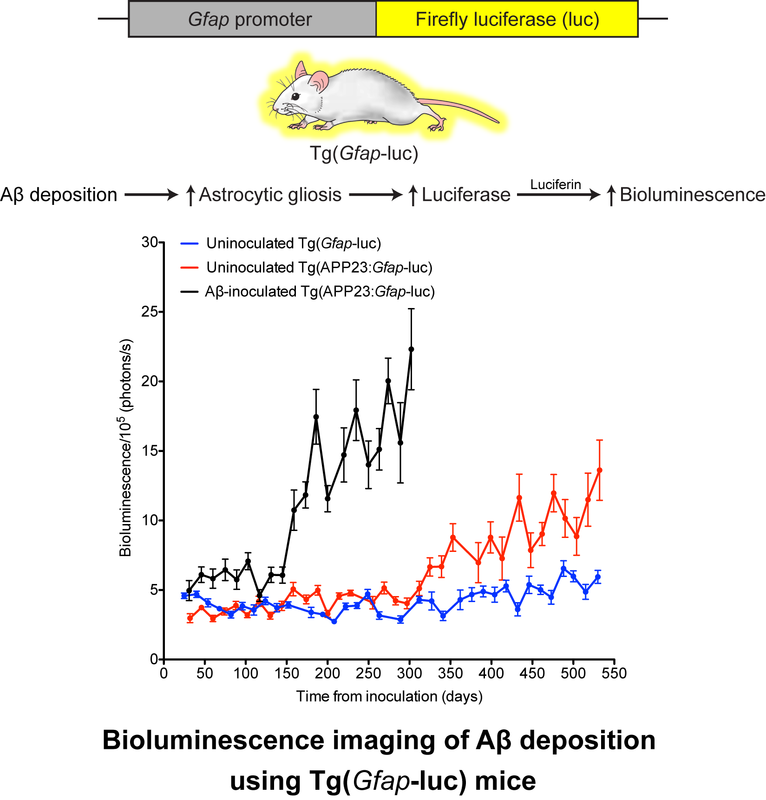 We have recently demonstrated that transgenic mice expressing a firefly luciferase reporter gene under the control of the glial fibrillary acidic protein (Gfap) promoter permit the kinetics of spontaneous and induced Aβ deposition in the brain to be monitored in vivo using bioluminescence imaging [Watts 2011]. My lab is interesting in designing improvements to this paradigm as well as developing novel genetic- and small molecule-based techniques for more directly monitoring protein aggregation in the brain.